So close, yet still so far away. That is how I am feeling about German Garden right now. It looks like there is not much left, but every time I sit down to work on it I realize there is still a ton to do. 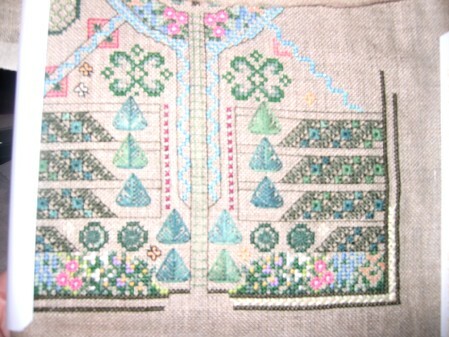 Today I worked on the outer border and on the laid trellis path up the middle. I really hope to finish this one by the end of the month as I really want to move on to other things, but am determined to finish this piece! You go girl! Its looking great! I’m working on a secret stitch right now that is that way. For months I’ve been thinking “just a couple of more sitting’s with this and it will be done”, not!! I’m finally on the backstitching though so I must be close to being done. It’s looking great. Can’t wait to see it all finished!